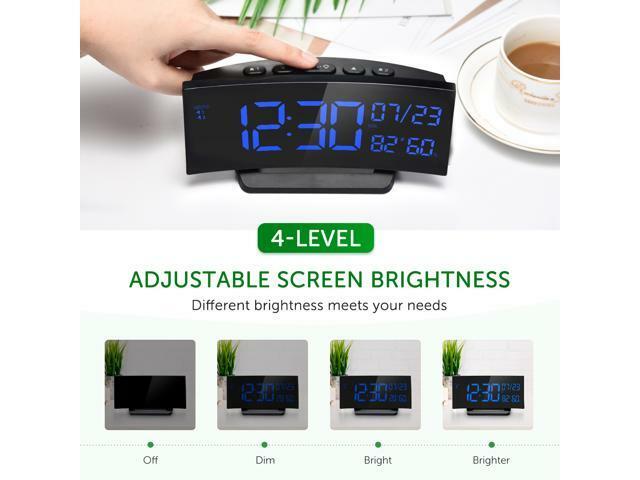 Premium 6.5” LED Display with Dimmer: 6.5inch curved-screen shows the time clearly, with Off/Dim/Low Light/Medium Light/Light/High Light 6 levels of brightness to be adjusted for your comfort. 12/24 hours can be set manually and 12 hours with AM/PM indicators. Dual Alarm with 3 Ringtones to Choose: Our clock comes with dual alarm which can be set in different time at the same day. 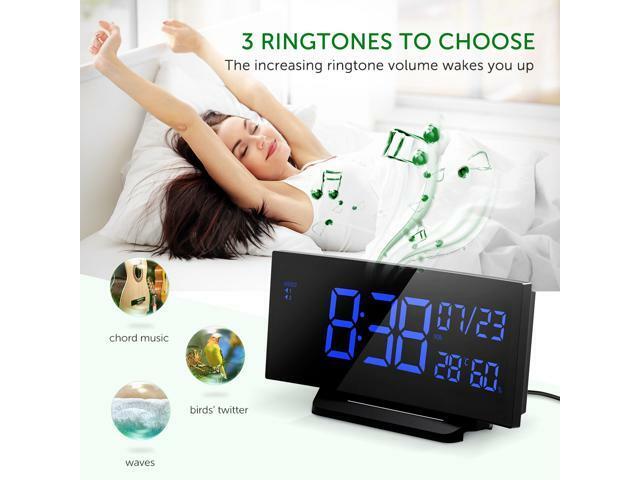 You can choose the sound of waves, birds’ twitter or chord music as the wake-up ringtone and enjoy getting up in the comfortable sound instead of noisy buzz. 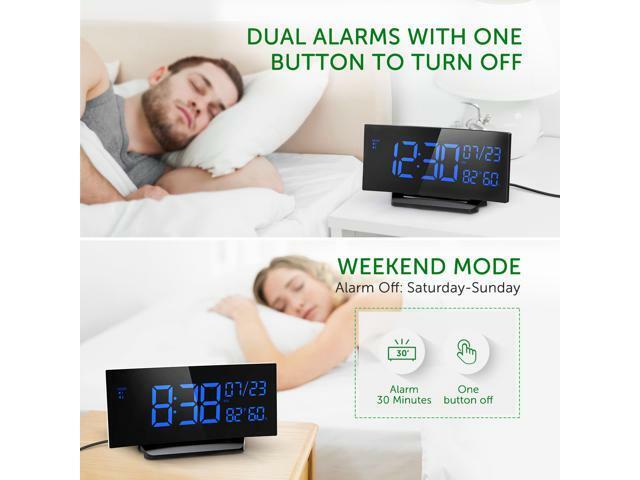 Snooze Function & Weekend Mode: Press the middle button on the top once to temporarily stop the alarm; when the preset snooze time passes (the default mode is 9 minutes), it will sound again. Long press it to turn off alarm. And you can also turn the button A (on the back side) to the WEEKEND MODE, the alarm will only sound from Monday to Friday. 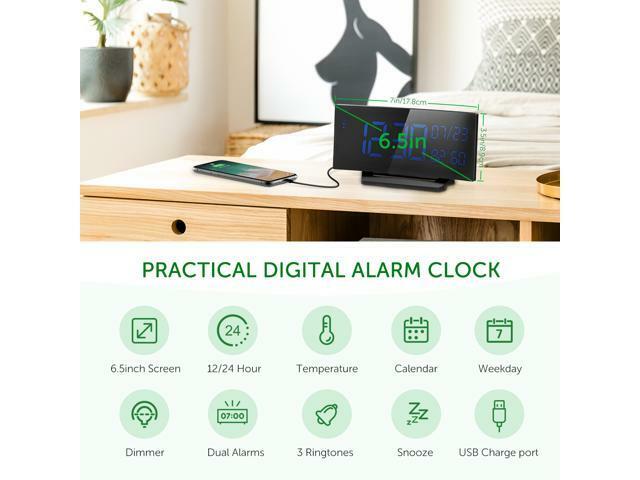 Multifunctional Clock: Compared with normal alarm clock, Mpow digital alarm clock provides you with detailed message like calendar, date, day of week, temperature and humidity. All of these messages bring you convenience with one glance at the clock. Backup Setting & USB Charge Port: With the USB output port, you can charge your iPhone/Android phones easily on the bedside when sleeping. 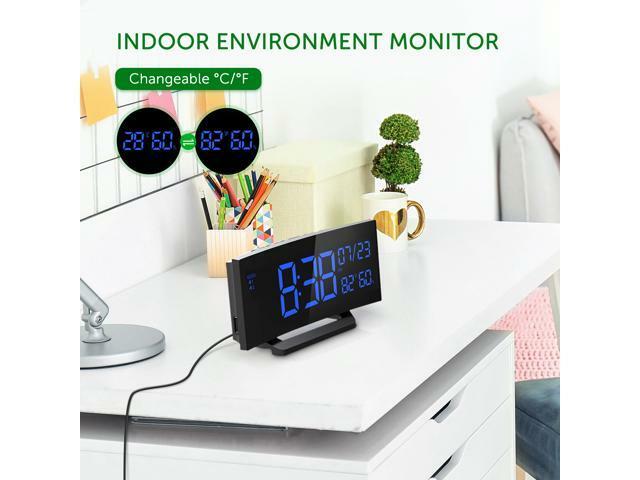 The included AC power adapter is required for using the clock normally, while backup battery only saves the clock setting in case of power outages. 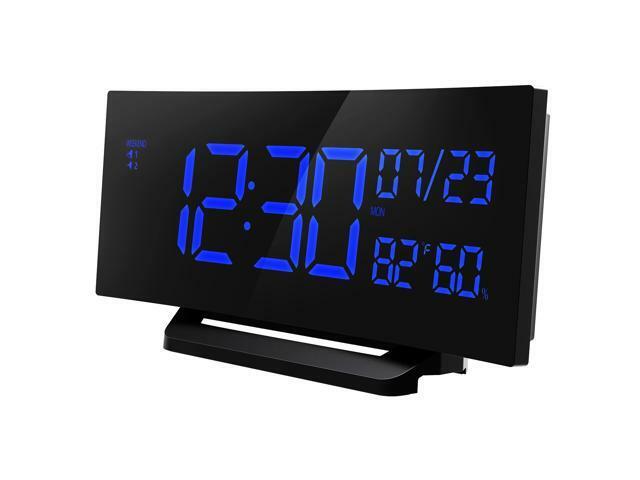 6.5inches large Display shows you with clear image about time, calendar, date, day of week, temperature and humidity. The brightness can be switch from Off/Dim/Low Light/Medium Light/Light/High Light. No matter dark environment, or bright area, you will always see the time clearly on the clock. Each alarm has its own button to control, suitable for your different wake-up time. Instead of traditional buzz sound, there are 3 ringtones set in the clock: waves, birds’ twitter and chord music. Choose your wake-up bell sound according to your favor! Once you turn on the weekend mode, your alarm won’t sound on Saturday and Sunday. This convenient design leaves you with quiet weekend. Enjoy your bedtime. 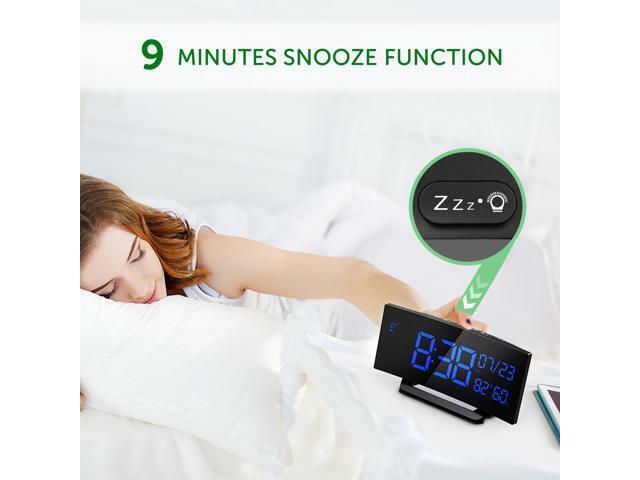 Mpow digital alarm clock not only shows the time and wakes you up, but also shows you with practical messages like calendar, date, day of week, temperature and humidity. Detailed and practical function matches your smart life. While you are sleeping, you can charge your iPhone/Android smartphones on your bedside for your convenience. No need to look for your charger or an extra adapter. Internal backup battery is set for saving your clock settings in case of power outage. In daily using, the included AC adapter is needed to supply power for the clock.